Wear This Ring From The Reflection Collection By Geet Jewels & Make A Style Statement That Compliments Your Inner Beauty. The Butterfly Is Perfectly Blended In Rose Gold & Her Feathers Are Shining With White Brilliant Cut Diamonds, That Blinks With Its Move. 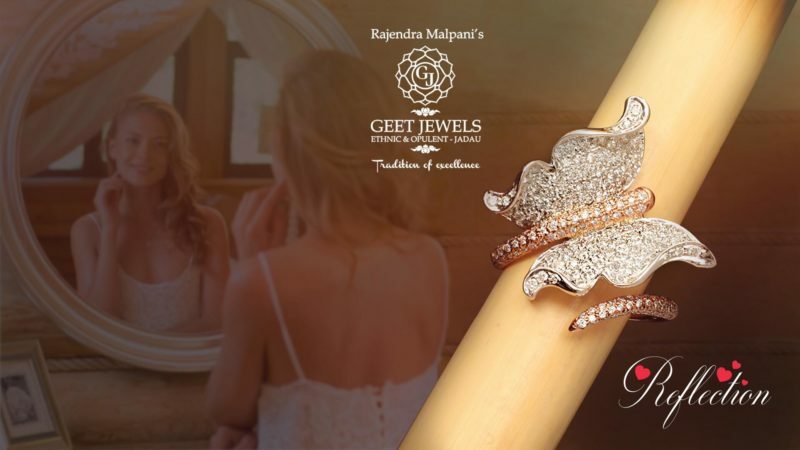 Geet Jewels has been proudly serving top-most jewellery houses and international brands over 3 decades with a mission to provide quality products and services at competitive prices, with innovation in their products. Our jewellery is handmade! Designes are inspired by the Mughals era with a blend of Gold, Polki, Diamond, Enameling and Precious Color Stones. Our handcrafted products of Gold Polki Meena Jewellery are just stunning. Reflection Of Style, Fashion, Beauty – Diva.